Free Lecture: MSNBC's Chris Matthews on "Tip and The Gipper"
From the author of the New York Times bestseller Jack Kennedy: Elusive Hero—and Tip O’Neill’s former chief-of-staff—comes Tip and the Gipper, the firsthand, one-of-a-kind story of the friendship between President Reagan and the Speaker of the House. They were the political odd couple—the two most powerful men in the country, a pair who, in author Chris Matthews’s words, “couldn’t be more different or more the same.” For six years Matthews was on the inside, watching the evolving relationship between President Ronald Reagan and Speaker of the House Tip O’Neill. 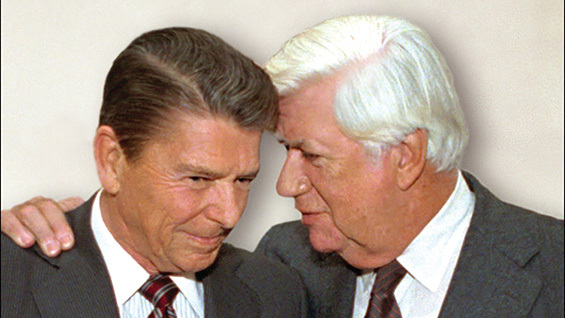 Their philosophies were miles apart—Reagan intent on scaling back government, O’Neill fervent in defending it. Yet there was common ground too: long lunches shared on St. Patrick’s Day and a mutual respect—political and personal. Three days after Reagan’s shooting, Tip was the first outsider at the president’s bedside. Drawing not only on his own remarkable knowledge but on extensive interviews with those closest to his subjects, Matthews, host of Hardball on MSNBC, brings this unlikely friendship to life in his unique voice, rendering as lively and novelistic a read as Jack Kennedy and a timely object lesson in how bipartisan cooperation can work.